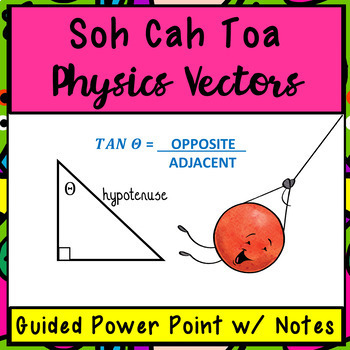 Need a deeper dive into SOH CAH TOA for your physics vectors? I've written this for our physics students that may not have been exposed to sine, cosine, and tangent. Every physics teacher knows they get all sorts of students in their classes. Sometimes that student has had tons of math. Sometimes they haven't. AND THAT IS OKAY. Recently, I've been getting more and more freshman in physics and I love them! They just need some scaffolding on breaking up vectors. I created the guided presentation and student notes for that wide variety of background, ages, and abilities! You will find a beautiful, professional, guided Power Point that is completely ready to go. Literally, a substitute could probably do this lesson. In fact, I wrote this in mind of the flipped classroom and a student slugging it out at home. 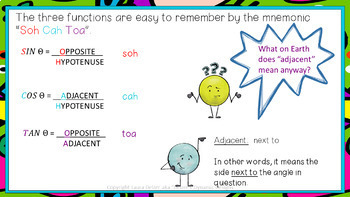 All answers are in the PP and the student has to click for the answer when they are ready. New Teachers and New-to-Physics Teachers: Never fear!!! I got you, Boo. This will catch your rusty skills up to speed too! It's okay! Watch for my other items coming out. I was blessed to work with and teach several cohorts of preservice teachers while working in grad school. ALL my items are written with you guys in mind!!! 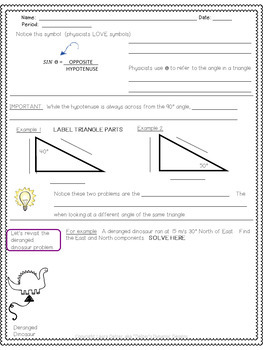 Your students will thank you for taking some breathing room and grinding on vectors and trigonometry before tackling harder physics problems! All problems solved for missing legs and missing angles. 6 pages of notes for students to fill out while working on the PowerPoint. 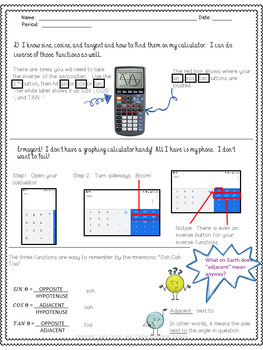 How to find the calculator buttons, both on a graphing calculator and the regular phone. Xerox the 6 page student packet. I suggest working through it ahead of time, especially if rusty. Wear your favorite physics shirt to work because all the work is done for you! Fully aligned with Physics TEKS. The PowerPoint is similarly protected. However. you can add, delete, and hide slides. You can still (somewhat) customize your presentation. Each slide is actually a png image (which protects the images). Copyright 2019 Laura Delzer aka "Delzer's Dynamic Designs". License is for 1 teacher. Please contact me for more licenses for colleagues. THANK YOU for respecting the incredible hours it takes to create these items. This particular resource took me about 30 hours.